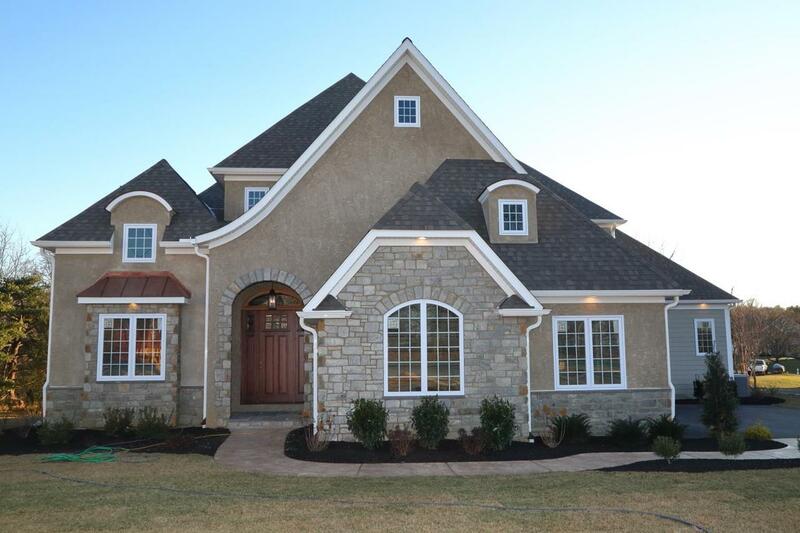 Custom English Tudor styling with eye-catching exterior stonework and design from Greystone Construction. From the Mahogany custom front door to the on-site finished white oak floors, the attention to detail cannot be missed with a beautiful home like this that you have never seen before. The grand entryway into the two story foyer has an extra bedroom/flex room featuring coffered ceilings and chair railing with an extra full bath just outside that includes a custom tiled shower. Through the foyer leading into the Great Room that features custom vaulted ceilings and beams that are absolutely breathtaking but also add a warm feel when sitting in front of the gas fireplace. Great room is open to a tremendous kitchen/dining area with 10' ceilings and quartz countertops with expansive island. The premium appliance package in this kitchen is surely a chef's dream. Lots of natural lighting with the many large Andersen windows throughout. A lovely hearth room is located off the dining with a floor to ceiling stone fireplace and repurposed barn wood on the ceiling. The hearth room is one to be desired and leads out to your back upper deck with a pleasant view of the creek. The Master suite is located on the main level featuring tray ceilings, His & Hers closets and a marble tile bathroom with a remarkable clawfoot freestanding tub and double vanity. 1st floor laundry includes a granite sink and tile flooring with wainscoting matching the built in cubbys leading you over to the walk in pantry down the hall. Upstairs offers 3 enormous bedrooms and one to include its own private bath with granite countertops and tile shower. Double vanity in hall bath with granite countertops as well. This masterpiece also features a side entry 3 car garage and a full daylight walk out basement for endless possibilities. Impeccable craftsmanship inspired by quality- look for yourself!